One common belief is that student debt prevents recent graduates from becoming homeowners. It’s believed that student loan payments make it unfeasible for recent graduates to save a down payment and a missed loan payment here or there makes them unsuitable candidates for a mortgage loan. While these factors are common explanations for low homeownership rates among recent graduates, the data does not support the belief that student debt prevents homeownership. Does Your Degree Make a Difference? Student debt from earning a bachelor’s degree or higher actually has a negligible impact on your likelihood of owning a home. A graduate with a four-year degree and no loans has a 70 percent probability of becoming a homeowner. If that same graduate has $50,000 of student debt, the probability only drops 4 percent—they still have a 66 percent chance of owning a home. The same effect holds true for student loans at the graduate degree level. 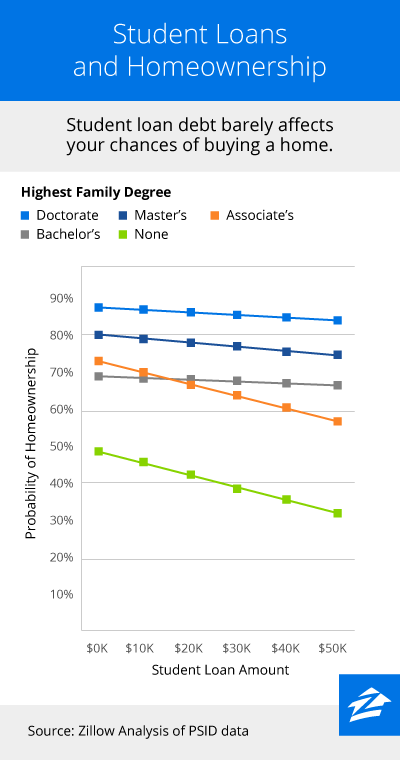 Those with medical, law or doctoral degrees actually have the highest probability of owning their homes, despite the steeper price of earning those degrees. Those with a doctorate degree and no loans have a staggering 87 percent likelihood of homeownership while those with a master’s and no loans have an 80 percent likelihood. Add in $50,000 of student debt for each of those degrees and the probability of homeownership drops to 84 and 75 percent, respectively. A higher level of education actually insulates borrowers from the negative effects of their student debt when they eventually buy. For married couples, the trend also proves true. The higher their collective level of education, the higher their likelihood of becoming homeowners, with greater amounts of student loans marginally lowering that probability. If at least one individual in a marriage has a bachelor’s degree but no loans, they have a 69.8 percent chance of owning a home. If that same couple has $30,000 of debt between them, their probability of owning a home falls to 67.7 percent—a mere 2.1 percent drop. Marital status and student loans do not substantially alter your odds of owning a home, as long as you earn a diploma. What If You Didn't Get Your Degree? Sensitivity to loans increases for those with less than a four-year degree. For someone with an associate’s degree and no loans, the probability of home ownership is 73 percent. However, if that individual graduated with an associate’s degree and $50,000 of student debt, the probability drops to 57 percent—a 16 percent decline. The odds are even worse for someone with no degree. The probability of homeownership, without any loans is 48 percent. Add in $50,000 of loans but no diploma and that likelihood falls to a low 33 percent. While student loans are an easy culprit for low homeownership rates, the data does not support this claim. Student loans have a little impact on becoming a homeowner for those with a bachelor’s degree or higher. A more likely explanation is that recent graduates are just taking their time renting before becoming homeowners. ← How Can I Get Started if I Don’t Have a Lot of Cash? Wholesaling Houses!